Cowshed is a brand that I have heard a lot of with regards to bodycare but I didn't know they made a lip balm, until now. I was kindly sent the product by Presents For Men - unusual gifts for men and women. The *Cowshed Lippy Cow Natural Lip Balm (£5.99, 12ml) contains a range of lovely certified organic, natural ingredients such as beeswax, castor seed oil, coconut oil (which everyone has been raving about recently for it's plethora of beauty uses), sweet orange oil and many more. The balm is suitable for vegetarians and it is free of parabens, sulphates and petrochemicals. 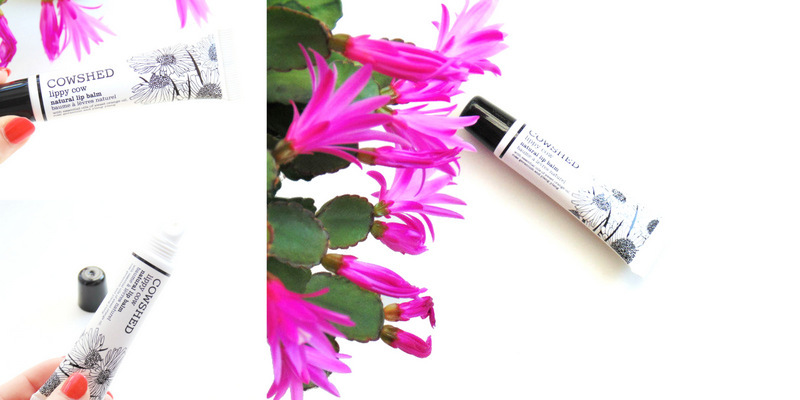 The balm comes in a squeeze tube so it is fantastic for traveling and keeping in my handbag. It is so quick and easy to apply; it also smells heavenly! To me it smells herbal and slightly floral - almost a scent you would find in a Lush store. The balm instantly smoothes, reduces dryness and adds slight glossy but not in a sticky way. The balm is quite oily feeling probably due to the essential oils in the lip balm. The essential oils are very nourishing and moisturising which makes the lips feels so smooth, hydrated and prepped for lipstick etc. Even though the balm is oily feeling and it contains oils, it doesn't separate in the tube as most oil based products do. Overall, I love the packaging, the scent of the balm and the way it makes my lips feel - so smooth and nourished. The balm is also very travel friendly and quick to use/work; it's my current favourite lip balm. Have you tried this lip balm or any other products from the brand Cowshed? This sounds like a lovely product due to it being all natural and organic, but I'm not sure if I'm a fan of the oiliness. I'd have to try it out though! Great review! Oooh I love cowshed! I had no idea they did a lipbalm either, though! Definitely worth a try. I have read great things about this brand but never tried anything from them. Will put this lip balm in my list to try. This looks amazing, I've never heard of it before! I've not heard of this brand before. I do like the blank and white packaging though! That's so great this is for vegans! Wouldn't think so with the name! I had no idea they did this actually, but I normally adore everything from Cowshed! This sounds really lovely! I've never actually heard about the brand before so thanks for sharing!